Amera is the trusted name for air medical transport services in St. Petersburg, Florida. We have enjoyed continued growth since we started out back in 2004, and we are very proud of the customer satisfaction rate we have been able to maintain. Our team members work hard to provide air medical solutions, and our clients often express their appreciation. In fact, we have a testimonials page on this website that you can take a look at to gain an understanding the level of service that we provide. This Pinellas County city is one of the best places to live in the entire state of Florida. The weather is fantastic all year around, the local beaches are beautiful, and the area is a paradise for golfers, boaters, and anglers. In addition to the natural side of things, there are countless cultural attractions, including the Salvador Dali Museum, the Museum of Fine Arts, the St. Petersburg Museum of History, and the Holocaust Museum. Though there are fine health care facilities in town, sometimes a particular brand of expertise is required. For example, there are highly renowned surgeons that can do things that most others simply cannot, they often work at medical centers that are specially equipped. Our St. Petersburg, Florida air medical transport team can get you to a facility anywhere in the world in a safe and efficient manner. 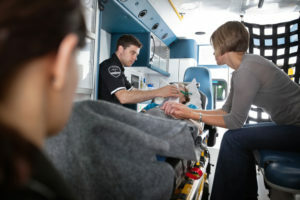 Plus, we have the ability to engage nurses and/or health care aides that are qualified to provide the appropriate care while you are en route. In addition to the dedicated air ambulance services that we offer, you can also rely on us if you are capable of taking a commercial flight as long as you have a professional aide by your side. You can rest assured that we will get you to your destination in a safe and efficient manner when the travel day comes. At the same time, you will recognize our commitment to friendly, communicative service from the first moment that you connect with us. As an added plus, you will probably be pleasantly surprised when you hear about our affordable pricing. If you would like to discuss your needs with one of our knowledgeable St. Petersburg, Florida air medical transport experts, we can be reached toll-free at 855-263-7215. You can alternately send us a message through our contact page if you would prefer to connect electronically.